Many succulents are well adapted to low-water landscapes because their thickened leaves store water, providing them the ability to survive dry, hot climates. Softer leaved succulents like Echeveria prefer shade in our region while the larger, cold-hardy Agave and Aloe species do well in full sun. 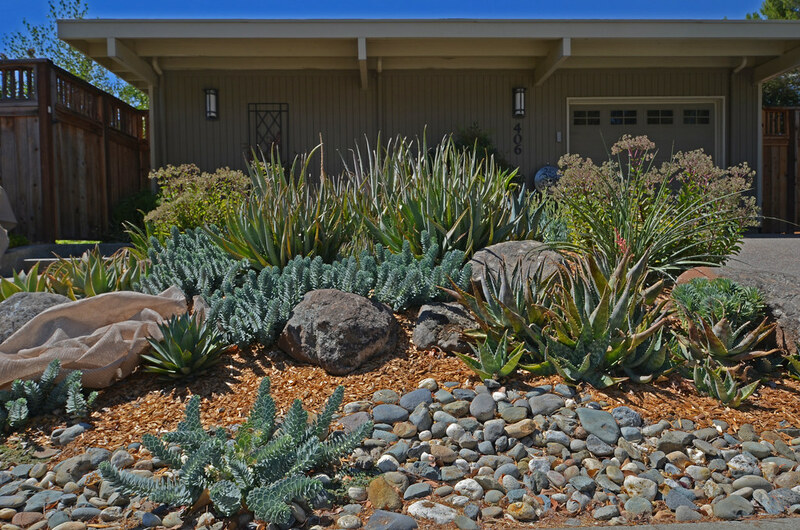 As people learn more about the unique forms and many benefits of succulents, their popularity continues to grow which is why we we were inspired to feature Frank and Mona Demasi’s front yard. Their smallish north-facing front yard resembles a rocky slope from a natural area in many dry climates of the world. South African aloes with thick fleshy leaves dominate the planting, producing candelabras of orange, red and yellow flowers frequented by hummingbirds for their nectar in early spring. Some Aloes grow like a shrub with woody stems while others like Aloe × ‘Caitlin’ makes horizontal short offsets call “pups” that spread over time to a large mass — perfect for sharing with like-minded succulent gardeners.